Well the weekly blog has become more like a monthly blog, if fact in future I think I will call it a monthly blog and then if I write more than one a month I will be overachieving. No excuses really for my tardiness, it has been very busy over the last four or five weeks, and I have been seeing a chiropractor two or three times a week for a bad back and a torn psoas muscle, I had never heard of it either, but it is very painful, it a muscle that runs from the lower back down the inside of the pelvis. According to the chiropractor I should refrain from lifting anything for six to eight weeks, but as a bookseller how do you stop lifting things we are always shifting boxes of books. 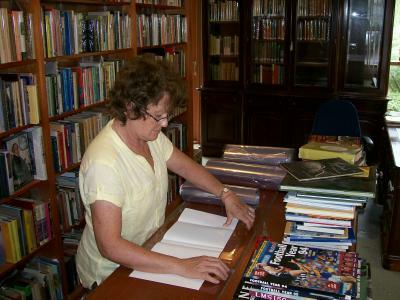 We have purchased three medium sized libraries over this period they have all had to be packed, transported back home, unloaded and stacked, while Maureen has done most of the lifting it is impossible not to do some lifting. One of these buying trips was to Canberra (Capital City of Australia) it's about an eight hour drive north of where we are in Frankston. We took up a small covered trailer it takes about 50 cartons of books, and over two days we managed to nearly fill the trailer. I don't have any hard statistics or readership/book ownership in various cities of Australia but I'm sure Canberra would be rated at the top of the list. Ever one you meet collects books in some area of interest and all seem to be avid readers. The city does have two universities and a huge percentage of the population are government or semi government workers, with high disposable incomes perhaps this explains it! If I was starting out again in bookselling I would certainly consider Canberra as a prime location. If any of you are in Canberra be sure to leave some time to visit the various bookshops. On the way home we made a slight detour to Harden a small country town in the Riverina District of NSW, where an old Methodist church has been turned into a bookshop with a stock of about 30,000 good quality books. I think every bookseller dreams about finding an old building in a country town and turning it into a bookshop. The transformation of this church has been beautifully done, with a lovely cottage garden surrounding the church, off road car parking provided, well signed so that everyone going through the town would be aware of the bookshop, perhaps the only thing missing is a coffee shop at the back of the church, seems to be the trend these days to incorporate a coffee shop into a bookshop. We were only there for about an hour, and while a few people came in I don't think any sales were made in that time, while the romance and dream of this type of book venture is enormous, I'm not sure about the financial practicality. Regardless I wish them all the best in this venture, and admire them for their efforts; they are living the dream of many booksellers. An often asked question is how do you price a secondhand book, and it is a good question because it depends on lots of different factors and there is no absolute answer. If the book is one that is fairly common then there is a market price, you can go onto one of the search engines like www.abebooks.com and see the range of prices that the book is selling for. If the book is a rare item you may still find copies on the search engine, additionally you can go to auction records and see what price it has sold for over the past years. You also need to consider the condition of your book and the condition of the books you are comparing it with, are they complete, do they have dustjackets, are the described as fair, good, very good, fine etc. And then there are the less analytical skills that a booksellers uses, experience, intuition, feel; in reality booksellers use these skills first and occasionally check with the market and auction records to ensure that they are not far off the mark with their pricing. But how do you price an item that you have never seen before, that has no auction records, and you have not sold or seen anything similar in your bookselling career. The Act is headed �An Act for the better Government of Her Majesty�s Australian Colonies� and is in effect an act of separation and independence from New South Wales, the first Victorian Parliamentary Paper and the foundation document of our modern state. The document itself is on blue parliamentary paper, ten pages in length with two pages of Schedules, not very attractive but obviously highly important, where do you start in trying to put a price on something like this. The price I paid for it is no guide, from memory the box of papers came with a shelf lot I purchased at auction; I probably paid a few hundred dollars for the books on the shelf and allowed little or nothing for the papers in the box. We sell other parliamentary papers of this period for between $50 and $300 depending on their subject matter, Aborigines, Gold, Railways being at the top end of that price range and the more procedural reports being at the lower end. 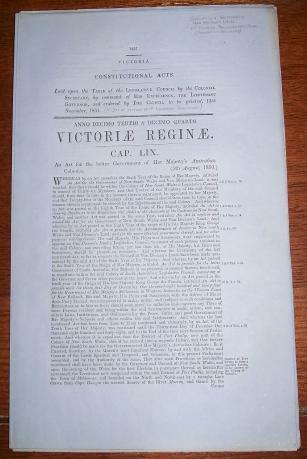 But this document stands out from the pack in its importance, it changes the District of Port Phillip into the self governing Colony of Victoria, it sets out the qualifications of voters, it revokes the powers of the New South Wales governor and council, it gives powers to the new government to make laws, levy taxes, etc. A similar document relating to the foundation of an American state would be valued in the tens of thousands, but I do not think our market would support the type of pricing it does, however it deserves to be priced well in excess of the parliamentary papers we sell for $300 on gold mining and the like. In the end it is a guess, albeit based on experience and intuition, we have priced the item at $1500. For those that are observant, I know it should be week eight, missed last week with the book fair in Hobart, had good intentions to upload a blog while at the fair, but for a whole heap of reasons, none of them very good did not get to it. We had a great six days break, the boat trip over was good, nice and calm, food in the restaurant was excellent, and the onboard entertainment kept us up till the wee hours of the morning. The weather in Tassie was a mild 23 to 27 degrees each day and no rain for the whole time we were there, the people are very friendly, and the place in general has that nice relaxed atmosphiere. 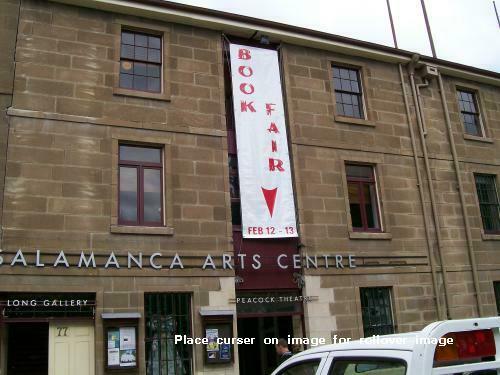 The book fair was held in the upstairs room of a great old sandstone building, lots a big exposed beams and balcony, windows openning out onto Salamanica place; we managed to fit 21 dealers into the room and over the two days of the fair some 700 people attended. Our sales were not very good, but I think that we took the wrong stock, ninety percent of what we took related to Tasmania, and our sales were almost exculsively in the few books we had that didn't relate to Tasmania. It seems that a Victorian dealer taking tassie books to sell to the Tasmanians is a bit like try to sell sand to the Arabs, most of the serious collectors already had the books we wrere displaying and most of them had very strong relationships with the local dealers from whom they buy their Tasmanian books. I look forward to the next fair in two years time, with a different stock I think we could make this a very profitable event. With the boat trips over and back, a day setting up and a day packing up we did not have much time to vist the local tourist attractions, however we did get a chance to vist their new modern art gallery MONA, this gallery has been built by local millionare David Walsh and houses his personal collection. The building itself is amazing and a work of art in its own right, the collection has high shock value and many sexual themes, but is thought provoking and does leave a lasting impression well worth a vist when in Hobart. We have included some photographs of the fair hope thes convey the atmosphere of the event. Many of our clients spend large sums of money and inordinate amounts of time putting together their book collections. One of the most often asked questions, is how should they look after their books. We all realise that with use and time they will suffer some form of deterioration, but most collectors would like to think that they are building up an asset which can be left to future generations or sold for a good market price. Care of books for the most part is very simple, the right environment, the correct use of archival products, and proper handling techniques, will ensure most books survive in almost their original purchased condition. Books like a fairly constant temperature, low humidity, no direct sunlight, good shelving, little or no dust, and lack of other contaminants in the air like cigarette smoke or smoke from and open fire as the odours of this smoke will stay with the books. Plan ahead with your shelving, always have a few empty shelves waiting to be filled, I regularly see collections where the quantity of books is running well ahead of the shelving, resulting in books piled on the ground, or stuffed in at right angles to the shelved books to use that last little bit of space above the top edges of the shelved books. We are very lucky in Victoria that we do not have to worry too much about humidity, in places nearer the tropics you may need air conditioning that reduces the humidity; high humidity will result in foxing and mould and worse, that musty smell which is almost impossible to remove. As a general rule do not use garages, sheds, basements, attics or spaces in roofs to store books, make sure that the books are up off the flooring, you would be amazed how a pile of books stacked on the floor can take up moisture from the flooring, particularly if it is the now common concrete slab flooring, this can occur even when the slab is covered with carpet or floating wooden flooring. Direct sunlight can quickly (two or three weeks), fade the dustjackets or cloth of your books, given that many dustjackets are more valuable than the books they cover, particular care should be taken to protecting them from sunlight. If your books are properly shelved and stored in the right environment, it is unlikely that dust is going to be a big problem; never the less a regular program of cleaning the shelving and dusting the top edges of your books should be maintained, which will see the books cleaned at least every two years. 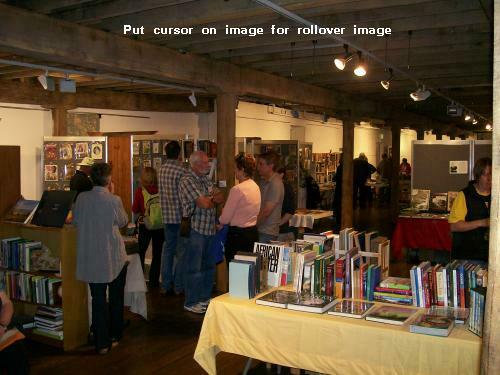 The use of Mylar coverings has become a standard practice with most collectors, make sure that the Mylar is acid free and is not itself going to mark the book; purchasing this through a library supplier will ensure it is of the right type. Alternatively, ask your local antiquarian dealer for the name of a supplier. Often books are purchased with associated newspaper cuttings, letters, postcards etc. tucked inside the cover, this is not a good practice, while these associated pieces of ephemera are of great interest and sometimes value, they will if stored in this way damage your book, either by marking the endpaper or pages with offset printing or staining and distorting the shape of the book. When people are handling your books make sure you explain how to remove a book from the shelf, hooking the book out from the top of the spine will do significant damage, make sure they understand to pull the book from the middle of the spine, thumb on one side, fingers on the other. It is preferable to open books on a desk or table, dropping a book does enormous damage to the corners, spine, and binding, try not to open older books past 150 degrees, if necessary use a support on one side, this helps stop the hinges and spine cracking. I was going to write today also about the care of Leather bindings but I think that deserves a Blog of its own, it is a more complicated subject and one which not everyone is in agreement on. While taking proper care of books is important, it is also important that we enjoy the use of our books, the two are not mutually exclusive; a little common sense and planing in how we store our books will ensure they last many lifetimes. One of the joys of bookselling is going out on a book buying expedition, more often than not you are disappointed and find nothing of value, but the expectation that the next house call might turn up a treasure trove of books makes this one of the most exciting and dramatic pastimes. A recent expedition well illustrates the highs and lows of this activity, I received a call from an old work colleague enquiring whether I could help by purchasing the library of a friends husband who had passed away several years before. The story went that the husband had an office lined with bookshelves from ceiling to floor, when he died, the wife had closed the door and had not been willing to go in there since, her family was worried about this and felt that if the books were removed it might help encourage his wife to better deal with the situation and to perhaps use the room for some new purpose. Because this was a request from a friend I did not spend any time questioning the lady on the type of books in the office, I just made an appointment to come and have a look at them. She lived in Flinders a small costal town overlooking the entrance to Western Port Bay about 80 Km from Melbourne, and 40 Km from where we are at Frankston. When I arrived I met a charming lady, most likely in her seventies, we chatted a little about the town, the weather and her garden, and then she took me through the house to the office. Expectation at this point is running high, what sort of books did he collect, what condition were they in, how many were there. The door opened and my heart sunk, the room had about 3000 books, and they were about as bad as they could possible be, several sets of encyclopedias, shelf after shelf of Readers Digest condensed books, thousands of paper backs mostly in poor condition, and thousands of magazines. 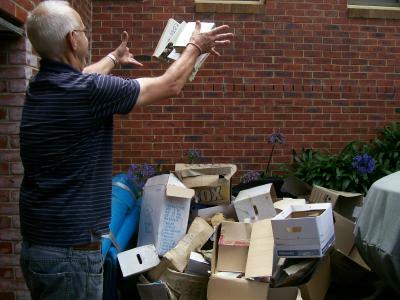 It would take two trips (about half a day) just to remove the books and most would be going straight to the tip, normally I would say a this stage that I was not interested in the collection and move on to the next house call. In this instance I was doing a favor for a friend and felt obligated to deal with the collection, I asked to be left alone for a while so that I could go through the books hoping that I could find a few books of value that would enable me to pay something for the collection and hopefully partly compensate me for the work involved in removing the books. After about an hour I had sorted out two cartons of books which I could use, the rest where going straight to the tip. I went back to the kitchen and explained as gently as I could to the lady that the books were of little value, I made her a token offer for the two cartons that I had pulled out and agreed that I would dispose of all the books in the room. She was most understanding, agreed on the offer and then said to sit down, she had just finished baking a cake and had boiled the kettle for a cup of tea. We started chatting about her husband, and she told me that it had been his life long dream to build a Stanley Steamer; he had a fully equipped work shop in the garage with lathes and machinery for making parts, as well as a collection of many steam engines and parts. Unfortunately he died before starting on this project. In passing I happened to make the comment that he didn�t have any books on steams cars, she said, oh yes he did, he had hundreds of books on steam cars, they are in the fridge in the garage! They were in the fridge, a very large two door commercial fridge; this was to protect them from the rats which by the look of the droppings infested the garage. It was an amazing collection, one I was happy to pay several thousand dollars for, had I not in passing asked the question about her husband having any books on his interest in steam cars I�m sure at a later stage the books would have been taken to the tip or sold for a few dollars in a garage sale. I�m not sure what the moral of this story is, but it does show why every booksellers is anxiously waiting to make that next house call because you just never know what you might find. What a week, our TV coverage has been blanketed with stories of the floods firstly in and around Brisbane and later in the week the north western towns of Victoria. The main topic of conversation where ever you go is the floods and the unusual amount of rain we have had over most of the country. Scenes of whole towns submerged in water, people being plucked from rooftops by helicopters, cars floating away, and piles of rubbish as people start to clean up the mess, images which shock us but if you are not directly involved still does not convey the real enormity of what is happening. This was brought home to me in a small way during the week when the drain at the end of our driveway blocked and a small amount (quarter of an inch deep) of water flowed into our store room. Water and books do not mix so we lost several cartons of books, but worse was the two days work that it took to clean up the mess, I still have a couple of trailer loads of soggy books and cardboard boxes to take to the tip. Imagine what it would be like to clean up after several meters of water had flowed through your house. Many of our clients live in the flood affected areas, and although I have not heard directly from any of them I imagine some will have lost their libraries of treasured books, along with other household possessions and in some cases loss of their house. As a business Time booksellers would like to make some small contribution to the recovery effort, for the month of February we will donate $1 for each book sold to the flood appeal and this will also include the books we sell at the Hobart book fair on the 12th and 13th February this should come to a total of a few hundred dollars for the month, while this is only a small amount if everyone not involved in the floods does something small I think we can all make a difference. The traditional view of an antiquarian bookshop, in literature and folklore is one of a quaint, cluttered, dusty shop with bookshelves overflowing and books piled high on all available surfaces and somewhere amongst the clutter the bookshop proprietor poring over some rare tome. Many of these impressions do fit but one in particular has become a thing of the past, dusty, since the value of dustjackets was realized in the late 1960s, most antiquarian bookshops go to great lengths to clean and protect their books, and covering dustjackets in archival mylar (polyester or plastic sheet) has become the norm. This trend is understandable; a clean bright dustjacket can increase the value of a book several fold. A typical example would be a first edition of Patrick Whites, The Aunts Story, in good condition with good dustjacket it fetches around $2000, while a similar copy without the dustjacket could be easily found for less than $300. This brings me back to the mylar covering, we cover all our books before they are put on the shelf as do most antiquarian dealers. Each book takes about half a meter of mylar roll, and over a month we cover more than 400 books using 200 meters, with some simple math�s, since the time we started selling books on the net ( June 1995), we have used over 36 Kilometers of mylar. Apart from the cost, a little over $1 per meter, this strikes me as environmentally irresponsible, antiquarian bookselling in most respects is the blueprint for an environmentally friendly pursuit. We recycle an item that has already been manufactured, we use very little power, and we provide pleasant employment for our staff. Unfortunately I see no way of going back, our customers now expect (almost demand), their books to be covered in mylar, but had I thought this through back in 1995 I may never have started using this product. First week of 2011 has been a good one; our latest acquisitions list which went out last weekend has been a great success, with over thirty orders coming from it within the first two days. At the start of each month we select a newly acquired book for our "Book of the Month" and feature it on our website. Sounds easy, but it is amazing how much debate this process of selection can generate. Do you select the most expensive book, the rarest item, the most unusual, the most interesting subject, one associated with the author signed or inscribed, should only the finest condition books be featured, etc? I like to find something in low to medium price band, less than $150, on a subject that is going to appeal to large percentage of our clients. Maureen on the other hand likes to select a book in fine condition that represents the top end of our stock; invariably these are more than $400 in price, often on fairly esoteric subjects that would only appeal to a small percentage of our client base. Well for the last two months Maureen has had her way and won the debate, her choice has been featured, and its hard to argue with success in both cases the book featured sold within 48 hours of listing. I have put a link to our book of the month below for those interested in looking at Maureen's choice for this month. In spite of Maureen's success I am not deterred, I'm determined to have my selection featured next month, it will be a fine book, in the lower price range, of interest to large part of our client base, and hopefully it will also sell within the first few hours of listing. Last week of 2010, not really the best time to start a blog about Time Booksellers, its been a hectic time with Christmas and New Year, Maureen's parents Joan and Norm staying with us for a couple of weeks, and mast of our staff on holidays. Our December sale has been a great success, and a large number of clients have been placing orders in the last week to take advantage of the 25% discount before close of business on Friday. While our sale has finished, our latest acquisition list for January goes out on Saturday the 1st and Maureen has spent the last couple of days working on this and will spend most of Saturday sending 9000+ emails out, they have to be sent in small batches of a couple hundred or they crash the system. We are both looking forward to 2011, we have decided to take Mondays off, the business will now be open 10am to 3 pm Tuesday to Saturday, and other times by appointment, we still love to meet up with our clients face to face and will always to arrange a mutually convenient time if they are travelling in our area. 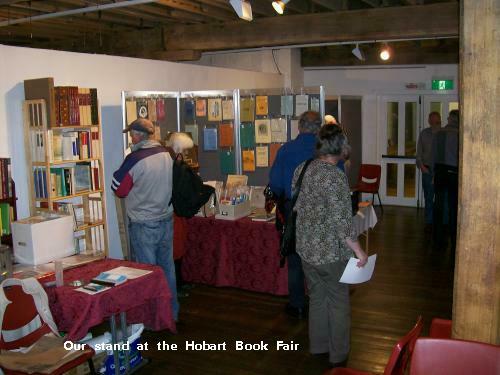 Our first event for 2011 will be a book fair in Hobart Tasmania on the weekend of the 11-12th February, I will start putting aside stock over the next couple of weeks for this fair. One of our resolutions for 2011 is to maintain this blog on a weekly basis, with lots of help from Amity, one of our staff who is savvy with social media. The Facebook page is Amity's initiative, I'm sure she would love to get your feedback on the page and any suggestions for future content. While I have met the deadline for the first week of the blog, time will tell whether I can get through the next 52 weeks without dropping the ball.